Research from the laboratory of Professor Julian Chen in the School of Molecular Sciences at Arizona State University recently uncovered a crucial step in the telomerase enzyme catalytic cycle. This catalytic cycle determines the ability of the human telomerase enzyme to synthesize DNA "repeats" (specific DNA segments of six nucleotides) onto chromosome ends, and so afford immortality in cells. Understanding the underlying mechanism of telomerase action offers new avenues toward effective anti-aging therapeutics. illustration depicting the enzyme telomerase This figure depicts the enzyme telomerase as well as telomeres relative to a chromosome. Counteracting the telomere shrinking process is the enzyme, telomerase, that uniquely holds the key to delaying or even reversing the cellular aging process. Telomerase offsets cellular aging by lengthening the telomeres, adding back lost DNA repeats to add time onto the molecular clock countdown, effectively extending the lifespan of the cell. Telomerase lengthens telomeres by repeatedly synthesizing very short DNA repeats of six nucleotides -- the building blocks of DNA -- with the sequence "GGTTAG" onto the chromosome ends from an RNA template located within the enzyme itself. However, the activity of the telomerase enzyme is insufficient to completely restore the lost telomeric DNA repeats, nor to stop cellular aging. This intrinsic brake of telomerase refers to a pause signal, encoded within the RNA template of telomerase itself, for the enzyme to stop DNA synthesis at the end of the sequence &apos;GGTTAG&apos;. When telomerase restarts DNA synthesis for the next DNA repeat, this pause signal is still active and limits DNA synthesis. 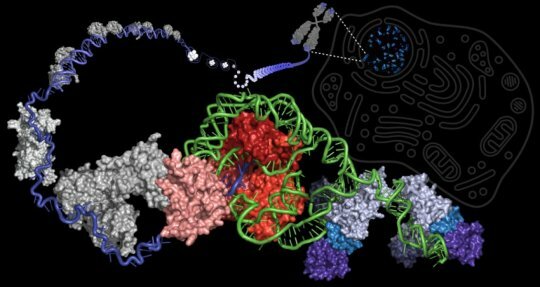 Moreover, the revelation of the braking system finally solves the decades-old mystery of why a single, specific nucleotide stimulates telomerase activity. By specifically targeting the pause signal that prevents restarting DNA repeat synthesis, telomerase enzymatic function can be supercharged to better stave off telomere length reduction, with the potential to rejuvenate aging human adult stem cells.